Beautiful. Simple. Elegant. Not necessarily intuitive. Expensive. Does that combination sound familiar, Apple fans? 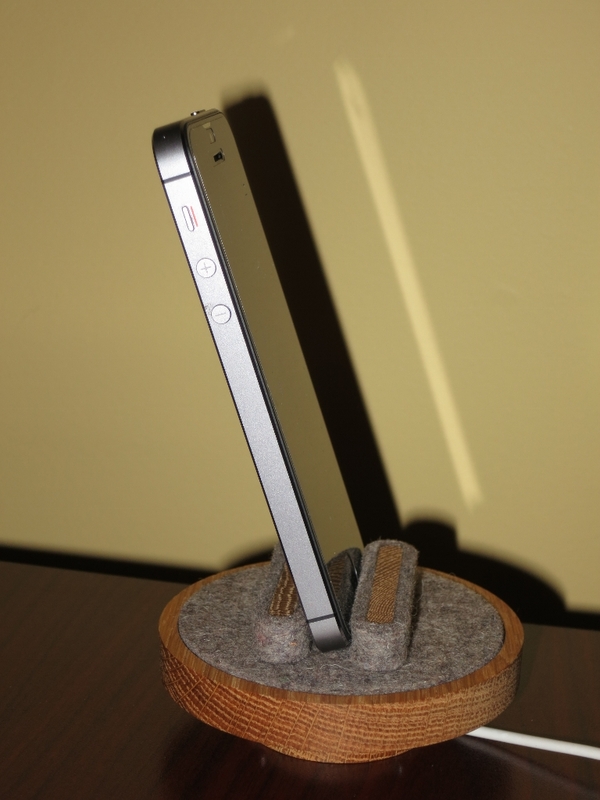 Read on for a review of the Spool Dock, from Quell & Company, a charging dock for iPhones that adds a touch of class to your desk or nightstand. 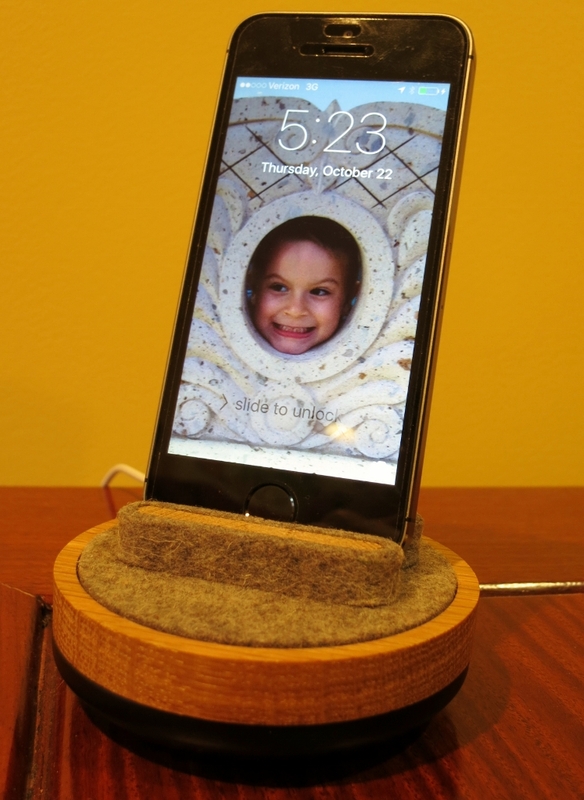 Spool Dock is compatible with iPhone 6, 6 Plus, 5, 5s, 5c, as well as the iPad mini and 5th generation iPod touch. It’s an attractive desktop charging station that provides access to the phone, functions as a cable manager with internal cable spooling, and supports rotating the phone on the base for better viewing. 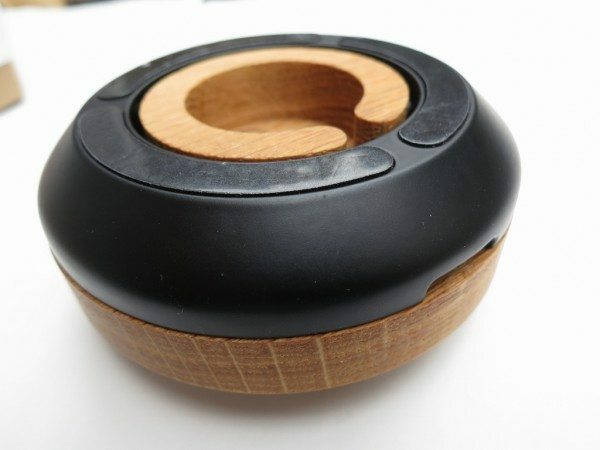 Quell & Company sent me a Spool Dock with a matte black metal base, reassuringly heavy, and a black walnut top. It arrived in a nice cardboard box with their clever logo on top. 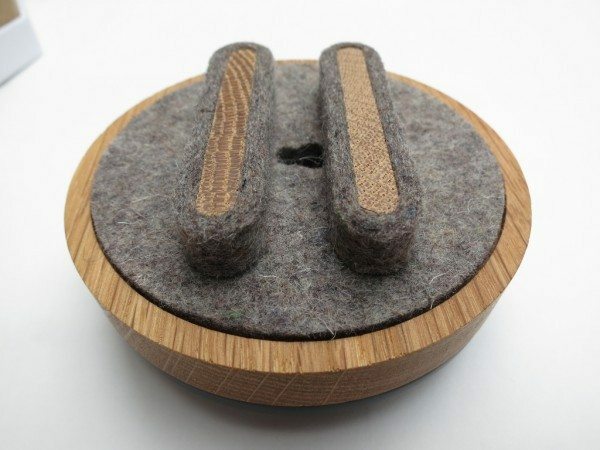 The rotating top piece includes grey merino wool padding set into the circular top and also covering the two inset pieces that help support the phone. 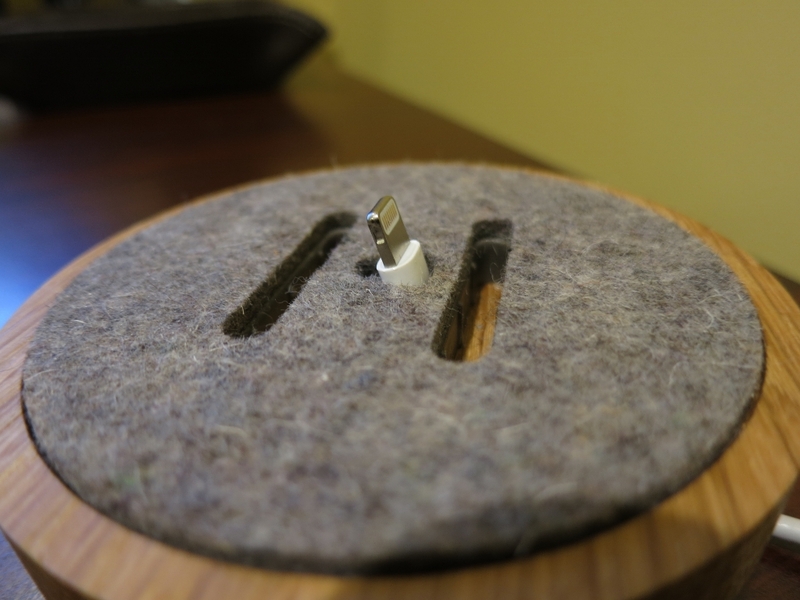 There is a hole through the middle for a lightning cable. The box includes no instructions, and I immediately had to visit the product website for help – how to thread the cable up through the dock to the device? 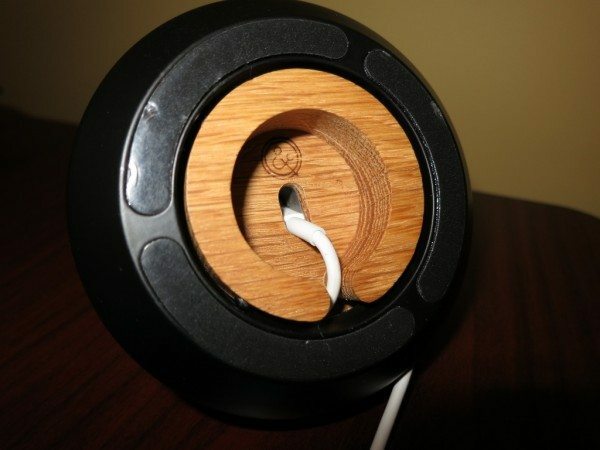 It turns out to be simple – just pull or pry the black base from the wooden top piece – once you read the online instructions and stop worrying that you might break the Spool Dock by doing so. The two pieces are held together with spring-loaded ball bearings that yield to firm pressure. The next step is to be sure that you have an Apple lightning cable, or a third-party cable with a connector that has exactly the same dimensions as the official Apple cable. I first tried one from Amazon, but the connector was too large to fit through the hole. The connector on the original Apple cable fit perfectly. Even after you get the connector through the hole, it’s tricky to position the connector to set it properly into the top of the dock. You must twist it 90° from the hole in the wood (parallel to the support inserts, which are best removed for this step – you can just pull them out) and angle the connector at 17° to find the grooved location to fit the connector. Again, I had to revert to the website and watch their handy video of the procedure. The instructions state that it’s easiest to connect your device to the cable for this step, but I found it easier to leave the phone to the side while figuring out exactly where to place the connector. If you get it on your first try, well done, but it took several pokes for me. When you’re done, though, the connector seats firmly in the tooled slot. Finally, the instructions point out that the support inserts are asymmetrically designed to accommodate different phone thicknesses, with and without a case. Here you can see them positioned for a narrow gap. I was able to adjust both of them to support Emilie’s iPhone 5S. Note that Spool Dock provides three contact points to support the phone. 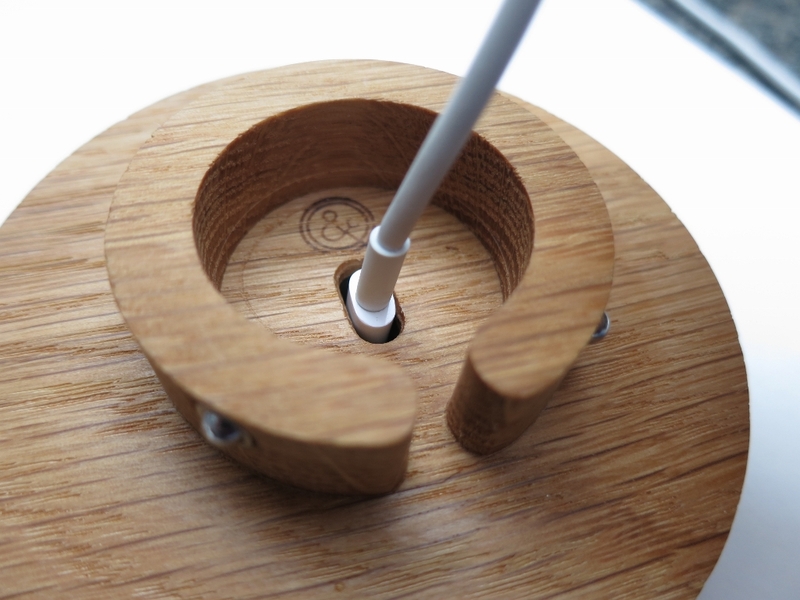 The cable connection itself is firmly inset into the dock, and the two support inserts reduce stress on the cable connection when using the phone in the stand. Emilie has an Otterbox case for the iPhone 5S. Fortunately for my testing scenario, she had grown frustrated with the case’s port cover and broke it off. 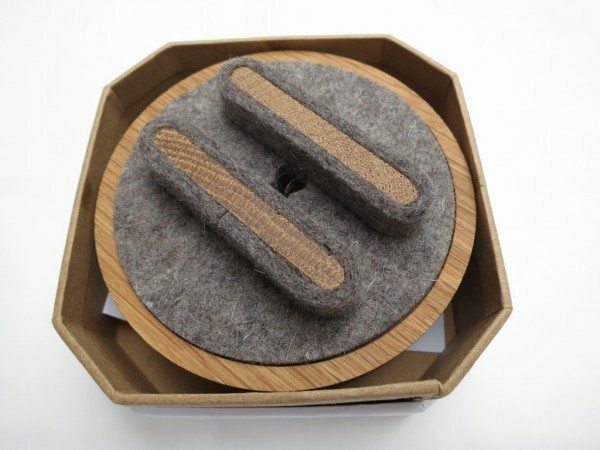 A case with a non-removable port cover would be difficult, if not impossible, to use with Spool Dock. 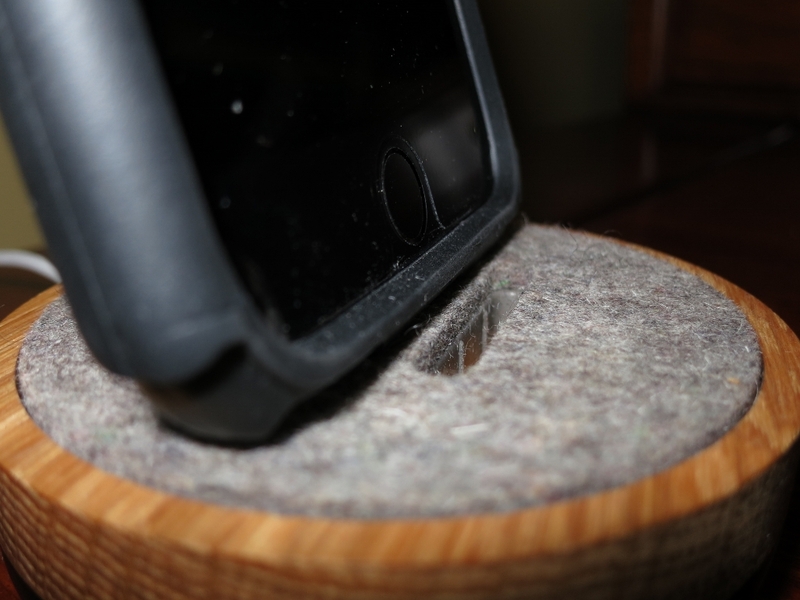 Even so, the Otterbox Defender case proved too thick to use with the Spool Dock. The support inserts just weren’t designed to provide enough room for the phone and case. So, Spool Dock will only support a case that’s neither bulky nor includes a cover over the power connection. The picture below shows that there was no chance of the Otterbox case fitting in the slot. So, back to a caseless phone. I readjusted the support inserts and practiced plugging and unplugging the phone. Not a problem, although I did find myself using two hands, one to steady the base while either pulling up on the phone or feeling for the port connection to plug into. It’s not as handy as wireless charging! However, the Spool Dock does have a feature to make things easier. Once you locate a permanent spot for the dock, you can peel the protective plastic film from its micro-suction pads on the bottom. 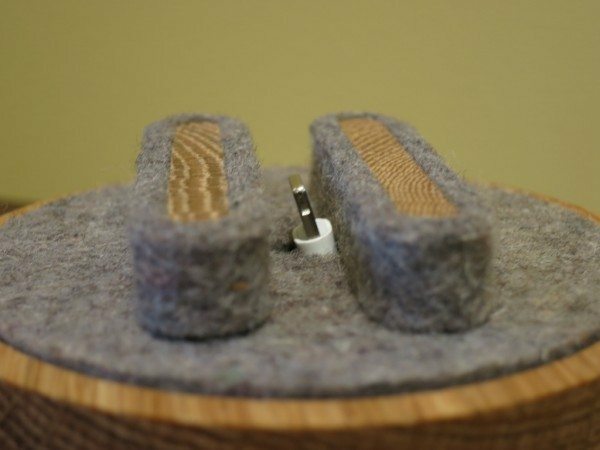 The base then sticks quite firmly to the desk or table surface, preventing the Spool Dock from sliding around, or lifting when you pull the phone off. This works quite well. While plugged in, the home button is partially covered, but accessible. You can only support and charge the phone in the vertical position. The phone felt solid and securely supported. Spool Dock also provides a cable management feature that works well when the base is firmly attached to the tabletop. 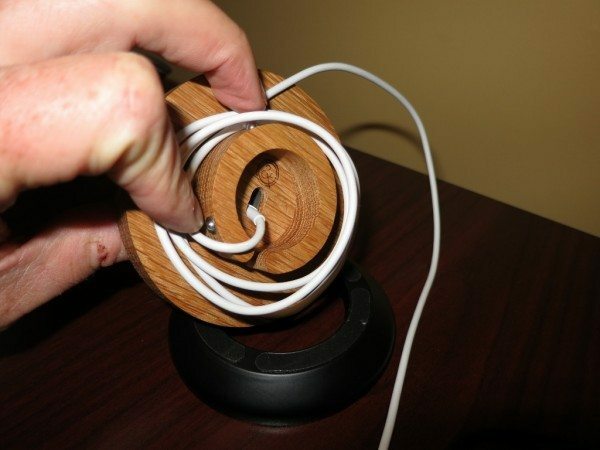 Simply rotate the top portion to wind or unwind the cable on the internal wooden spool. 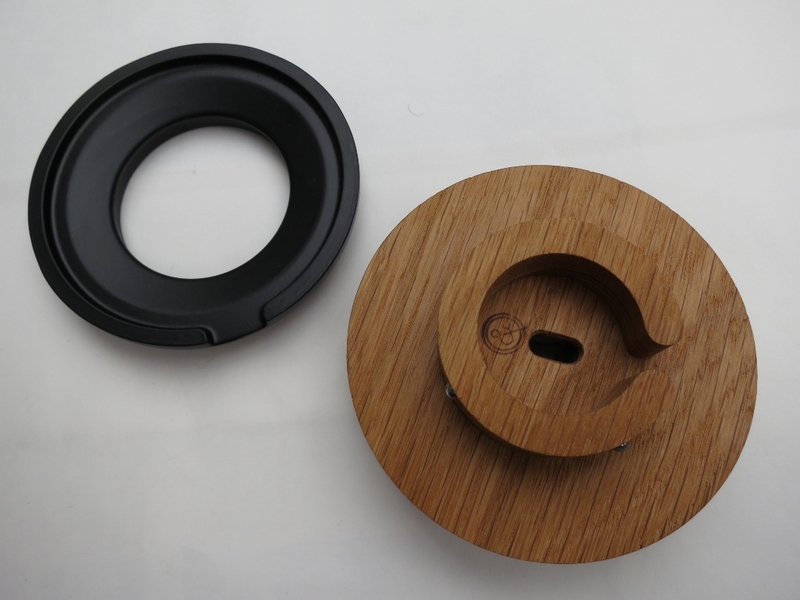 The rotating top is also useful for adjusting the viewing angle of the phone. Here I removed the base to get a shot of the cable wound on the spool. Finally, I tried Emilie’s new iPhone 6 Plus. She has a case – again with the port covers cut out – that isn’t big and bulky like the Otterbox Defender, but it still has a pretty thick lip around the front glass. This lip just doesn’t allow the phone to fit into the Spool Dock with the front support in place. The phone is wedged tightly against the rear support insert, so it actually still feels pretty secure. It may not receive long-term use – without the front support, I worry about added cable stress and internal stress on the connector port – but it works for the moment and we’ll just have to see if the convenience of a simple plug-in dock makes this a keeper. Without the case, the phone would fit easily, so if Emilie really likes the Spool Dock we may shop for a thinner case! 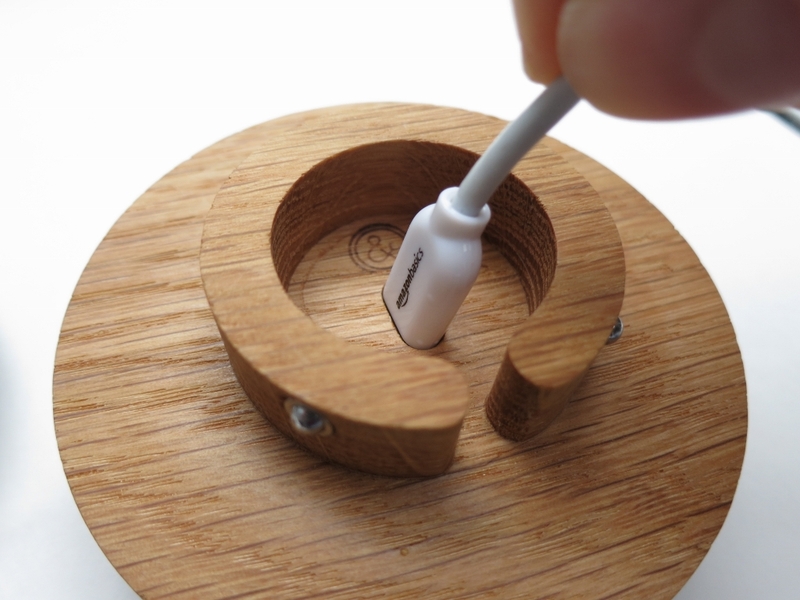 Note: As for my Samsung phone, I’ve just never seen a microUSB connector that would be small enough to fit the Spool Dock. This gadget is for iPhones only! I had a little difficulty with setup, but that’s a one-time learning curve. 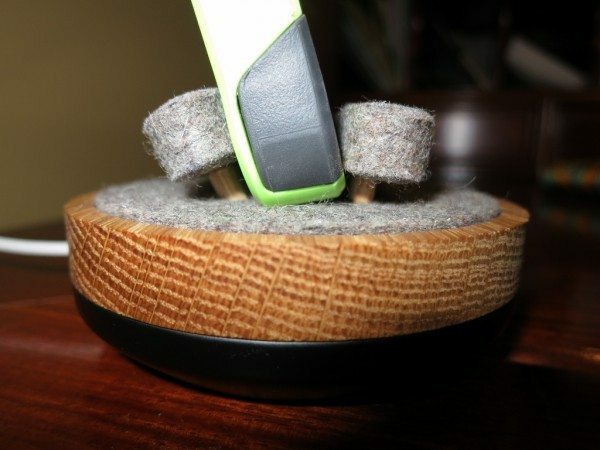 Once you understand how Spool Dock works, it’s fairly simple, and may be the perfect desktop accessory for your iPhone. Or it may not. Spool Dock is a one-trick pony, designed to hold your specific iPhone in a vertical position while charging that device only. You must provide your own lightning cable, probably dedicated to this purpose, and many third-party cables won’t be compatible. 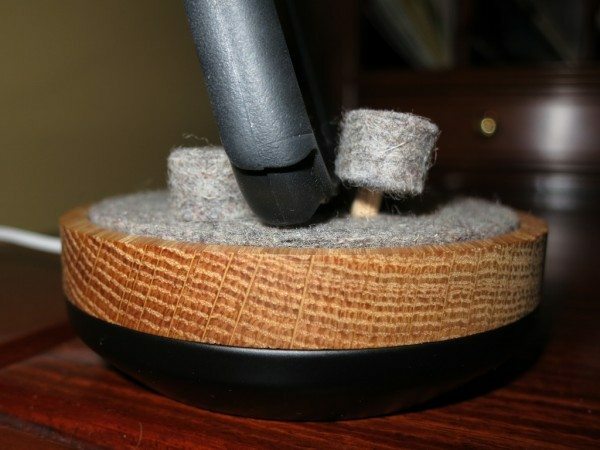 If you don’t see these limitations as drawbacks, and aren’t put off by the $65 price (plus self-supplied cable), then what you’ll enjoy are the natural look of wood and wool, the clean lines, the rotating base to adjust the viewing angle and reduce cable mess, and the ease of docking and undocking due to the weight of the base and suction pads. 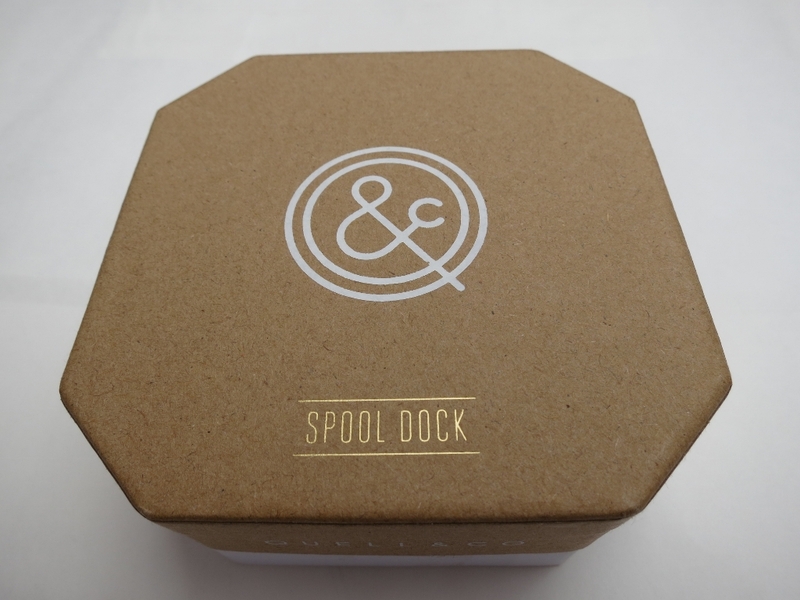 Spool Dock is clearly a step up from your run-of-the-mill phone dock. Source: The sample for this review was provided by Quell & Company. Please visit their site for more info about this product.